Charlotte, N.C., July 12, 2012 – Crosland Southeast announced plans to develop Flowers Crossroads as part of the master-planned Flowers Plantation development in Clayton, N.C. Construction will begin on the first phase of the 125,000-square-foot center in late fall 2012 with an anticipated opening date of fall 2013. Flowers Crossroads will be a 28-acre multi-use site which will be anchored by the first Harris Teeter grocery store in Johnston County, just southeast of Raleigh, N.C. The site is located at the entrance of 3,000-acre Flowers Plantation located on Highway 42, east of Clayton, owned by the Flowers family. The community has been under development since 1986. It was the first zoned PUD in the county with a reserved residential development density of 7,790 homes and unlimited commercial space. The shopping center will also feature extensive green space and gathering areas, two small shop buildings and three outparcels. “We are very excited to bring a high quality development and anchor tenant to legacy family-owned land by meeting the needs of the community,” said Crosland Southeast partner, Mike Wiggins, who is leading the development. 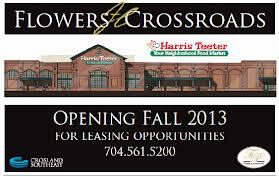 The 53,000 square foot Harris Teeter store is expected to have a drive-up pharmacy window and express lane ordering. The store will also be built with green building features such as a white reflective energy efficient roof, motion detection lighting, low-flow faucets, non-ozone depleting refrigerant as well as heat reclamation and energy management systems. There are currently 115 active residential subdivisions within a five-mile trade area which will utilize Flowers Crossroads for all necessity shopping goods. The historical growth of this trade area was six percent between 2001 and 2010 according to Census Bureau data. Today, Crosland Southeast perpetuates the excellence of the legacy company with its emphasis on retail acquisitions, advisory services, single-tenant development and the development of high-quality retail and mixed-use projects. The team is currently developing such projects as Stonebridge in Richmond, VA, which was named Virginia’s Best Public/Private Partnership of 2012 by the Virginia Business publication, the final phase to the 260-acre Blakeney development in South Charlotte and a very active single-tenant build-to-suit pipeline. During their tenure, the team has developed over 24 million square feet of retail space.